Italian people like to sit at the dining table and share good food with their families and friends. That is all that make them happy. Yes, there are happiness and laughter when sharing your good food with your families and friends. You can get the same kind of feeling when you come to the Bella Pasta Promotion at Sailendra Restaurant of JW Marriott Hotel in Jakarta. The beautiful pasta will be ready to be served from 20 to 29 May 2016. Pasta becomes the main theme of this promotion because Italian cuisine is well known for its wide variety of pasta. There are many different shapes of pasta, such as penne, macaroni, spaghetti, linguine, fusilli, lasagna and many more varieties that are filled with other ingredients like ravioli and tortellini. The Bella Pasta Promotion is also emphasizing the fact that Italian cuisine is simple, where most of the dishes having only four to eight ingredients, and has great quality in the ingredients. But before you taste them, let me be your guide to the beautiful world of pasta! Caprese Salad is the most delicious salads I have ever tasted. This simple traditional Italian salad is made with Vine-ripened Tomatoes that are red, juicy and flavorful but not overly soft. Add them with fragrant and flavorful Green Basil, and fresh and moist Mozzarella. Finally, there is a mix of Balsamic, Pesto and genuine Olive Oil. Very healthy and delicious! This makes an excellent and fresh lunch at the dry season, or a great starter if you take it in small portion. Carpaccio is almost like Sashimi, but it is marinated one. The marinated raw Tuna is thinly sliced. The easy starter can wake up your tongue like a coffee for your eyes! A sprinkle of Lemon gives something fresh for this yummy appetizer, while some dots of Avocado Puree and Pine Nuts makes the taste round and full. Rocket Leaves or popularly known as Arugula or Salad Rocket is nutritious green-leafy vegetable that gives a bitter sweet peppery flavor to the dishes. Panzanella is simply a Tomato-Bread Salad. This is a rustic-Italian Salad made with day old and crusty Bread, fresh Tomatoes, and Mozzarella Cheese. As it tastes so fresh, it is perfect enough to be consumed as a light supper or lunch. In Italy, Panzanella is also the perfect place to use those soft Tomatoes that are still rich in flavor. Pappa Pomodoro Soup is a rustic Tomato and Bread dish that tastes like a combination of Soup and Porridge. With Parmesan and Basil, the soup becomes very tasty. A very perfect combination of taste between sour taste from the Tomato, salty taste from the Parmesan, and fresh feeling from the Basil. The Bread comes in between to balance the taste and to thicken the texture of the Tomato Soup. Personally, I really love the Soup! This is my favorite dish! I think the Soup is perfect enough to be consumed when the rainy days come to warm the cold soul. So hearty, so romantic! Love! Love! Love! The Cappelletti reminds me of the Dumplings in the Chinese food or the "Pangsit" in Indonesian Noodle dishes, but Cappelletti is a bit thicker and healthier. How come healthier? Because it is filled with Wild Mushroom. Wild Mushroom? Don't worry, because this Wild Mushroom is the edible ones. With all the Brown Butter, Chives and Pomodoro Basilico that are mixed with the Cappelletti, the dish becomes so fruitful. This dish is good for those who can not eat meat, are vegetarian and food combining practitioner. I always love Seafood and Squid Ink! And I can find both of them at this food. Huuurrraaahhh!!! This is heaven for Seafood lovers! The Veloute has multi purpose in the culinary arts, as it can be used as soup or sauce. The Seafood Veloute or the traditional thick Seafood Soup, taken from a French term, becomes a delicious sauce to the Squid Ink Ravioli. Very delicious! I always love Fish, and this is another delicious dish. The Red Snapper (Reddish Marine Fish) is cooked with Tomato, Olive, Lemon and other ingredients that give deliciously sour and juicy tastes. All the ingredients are truly going through every slice of the Red Snapper. So no matter where you bite, you can always find all parts of the ingredients in the fish. It shows that they way of cooking this dish is perfect. Bravo! In Indonesia, we have almost the same kind version of this food, and it is called "Daging Gulung" or "Rolade" which taken from the word in English "Roulade". When I eat the Beef Involtini, it all reminds me of all the "Daging Gulung" that my Mother cooks. Yes! I can find home from this dish! The difference is the Sauce and the Parmesan Cheese. My Mother cooks "Daging Gulung" with Brown Sauce and without Parmesan Cheese, while Beef Involtini has Tomato Sauce and Parmesan Cheese. The "Daging Gulung" tastes sweet, while Beef Involtini tastes sour and salty. As Indonesian, Rice is our daily food. But what I love the most about the Risotto is that it is always cooked in such way that it tastes more creamy and chewable. The Seafood Risotto becomes delicious because the Cream Sauce, the Parmesan Cheese and the Shrimp truly completes each others that produces sour and savory taste. This dish can be eaten alone as main dish or together as side dish with the other main dishes. Tiramisu is a Pudding-like dessert that is made from Sponge Cake or Ladyfingers dipped in a Liqueur, Coffee and Sugar, then layered with grated Chocolate and rich Custard. The portion of the Tiramisu here is enough for me to cheer up my throat after all the Italian dishes I eat. The Italian 'cooked Cream' Dessert is made from sweetened Cream thickened with Gelatin and Molded. This Panna Cotta is mixed and aromatized with Mango that gives a sweet, sour and fruity taste. Yummy! It is semi-frozen Dessert from Eggs, Sugar and Cream that feels like frozen Mousse. Because of its ingredients and texture, the dessert is often called as an Ice-Cream Cake. The Nutty taste of Macadamia and the Bitter taste of Coffee comes in between to balance the sweetness and the creaminess of the Dessert. So don't worry, the Dessert doesn't taste too sweet. It is very good for a not-sweet-tooth-kind-of-person like me. So, who is the bad guy behind all the Italian chaos in my belly? Let me introduce you to the Executive "Master" Chef Francisco Holmes Brown from the JW Marriott Jakarta Hotel. The former banker who likes all kind of cheese and Indonesian food have mastered all type of cuisines, such as Asian, Middle East, Latin, and Italian. Looking at the blood that runs inside his body - a mix of English blood from his Father and Italian blood from his Mother, and his childhood experiences in Buenos Aires, Argentina, you can expect that his cooking style will be influenced by those many factors. 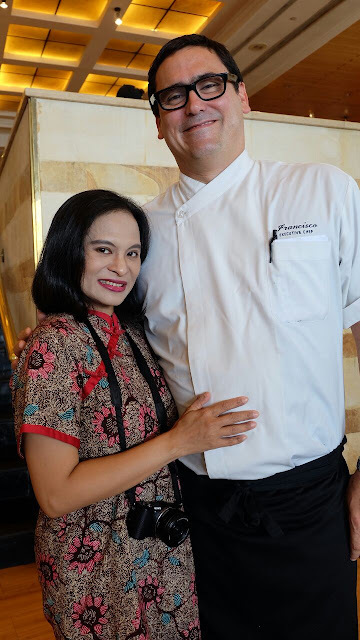 Together with his creative culinary team, Chef Francisco has prepared such delicious Italian dishes that he took from his family's secret recipes. Have a happy heart day, everyone!